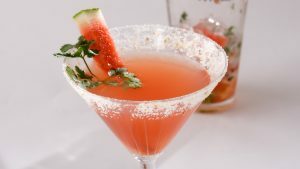 But one of my favorite watermelon cocktails is the “Smitten”; tequila, fresh watermelon chunks, lime, a little simple syrup, a few sprigs of cilantro and a dash of hot sauce – it’s something a little different and d’lish! 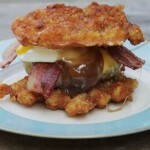 Have you seen all the crazy food videos on Facebook from Tasty, Tastemade, and Buzzfeed Food? These are Snack Sized Videos featuring recipes that are not only visually appealing, but are quick to make and delicious to eat. I like to call this “Speed Scratch Cooking” and they are blowing up right now on social media, offering creative twists on classic comfort foods. We are all busy these days, running from one appointment to the next. When you throw in a few kids, a dog, and let’s not forget the friends and family, who has time for a home cooked meal? These videos offer lots of variety and endless ideas so there is something for everyone. 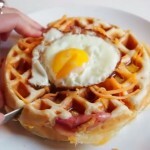 For example – have you seen all the fun things you can put on a waffle iron? 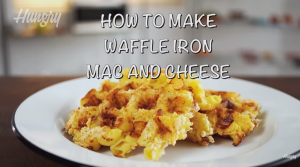 This Waffle Iron Mac & Cheese from Hungry takes waffles to the next level with chilled Mac & Cheese, bacon, green onions, and MORE CHEESE, pressed into a waffle iron until crispy and delicious then topped with all kinds of fun toppings. Who can say no to that? Yum! Buzzfeed also has its share of waffle iron goodies like these All Day Breakfast Burgers, Cinnamon Roll Waffles with Nutella, or Ham and Cheese Waffles, and more. Beyond the quick fixes, these videos also have unique and crafty ways to use up left overs or re-imagine a kitchen staple in new and exciting ways. Like this Ice Cream Bread! Start with melted vanilla ice cream, mix in flour, and all kinds of colorful sprinkles and jimmies, bake it, and voila! Super colorful and tasty dessert bread that will have everyone asking for more. Although I love them, figs are so much more than the iconic Fig Newton, which by the way was first sold dried in a commercially manufactured cookie in 1892. Who knew? Figs: they’re unusual, versatile, and even grow well here in Seattle. I have a fig tree in my backyard! A plump fig growing in my back Urban Garden – ready to be picked! It’s best to pick figs when fully ripened. 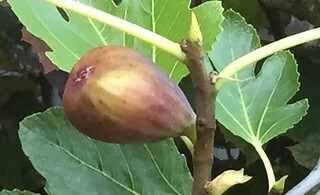 The fig is ready for harvest when it drops on the stem from its own weight. Pick with the stems attached, but always plan to use within a few days. Although in the kitchen we consider it a fruit, the fig is actually a flower that is inverted into itself. There are no blossoms on the tree’s branches; the blossom is inside the fig. Many tiny flowers produce the crunchy little seeds that give figs their unusual taste and texture. Figs are of course fabulous fresh, but you can also cook up some creative dishes with them too. Preheat an oven to 425°F. In a small bowl, mix the Gorgonzola and walnuts. Arrange the figs, cut side up, on an ungreased baking sheet, and top each piece with 1 generous teaspoon of the Gorgonzola mixture. Roast the figs for about 6 to 8 minutes, or until heated through and the cheese is hot. 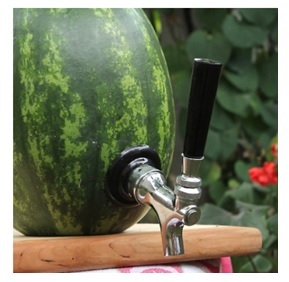 Let cool slightly and enjoy! Recipe © from Kathy Casey’s Northwest Table Cookbook. Did you know fennel grows like a weed in the Pacific Northwest? Especially in Ballard. I see it growing along the road on my commute to work every morning and it grows beautifully in my urban parking lot garden! It’s basically a weed – a delicious, anise-flavored weed. Fennel growing in my urban garden! If you want to try planting it, find some growing wild and then harvest the seeds in the fall. Sprinkle the seeds around your garden, but be careful. It likes to grow and spread everywhere. 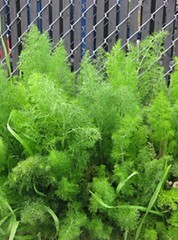 If you happen to have wild fennel in your neighborhood or garden you can use the whole plant. Early tender fennel fronds chopped and added to a salad. Even the coveted fennel pollen picked from the flowers are great in dishes – so elegant and trendy to sprinkle over almost anything. Here is a link to my Liquid Kitchen video on Small Screen Network to see how to make Fennel-Roasted Walnuts – a great nibble to serve with your favorite cocktail. This recipe is from my book Sips & Apps and is one of my favorites. Perfect to take to a party, or even bag up for little gifts. Preheat an oven to 250 degrees F. Spray a rimmed baking sheet with cooking spray, or lightly oil it. 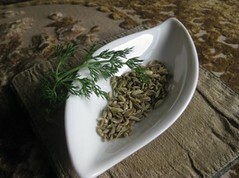 Grind the fennel seed in a spice grinder or mortar and pestle until finely ground. In a large bowl, mix the ground fennel with the sugar, salt, and pepper. Set aside. In a large bowl, whisk the egg white until frothy. Add the nuts and toss to coat evenly. Using a fine-mesh strainer, drain off excess egg white. Add the drained nuts to the spice mixture and stir to coat evenly. Spread the nuts on the pan; they will be a little thicker than a single layer. Roast for 20 minutes. Stir, and roast for 20 minutes more, until the nuts are golden and crisp. Remove from the oven and stir the nuts on the baking sheet but do not remove them. Be sure to let the nuts cool completely and become crisp. Store in an airtight container at room temperature for up to 2 weeks. If necessary, recrisp them in a 350 degree F oven for a few minutes before serving. Mother’s Day is coming up next weekend. I KNOW I don’t need to remind you (wink, wink). 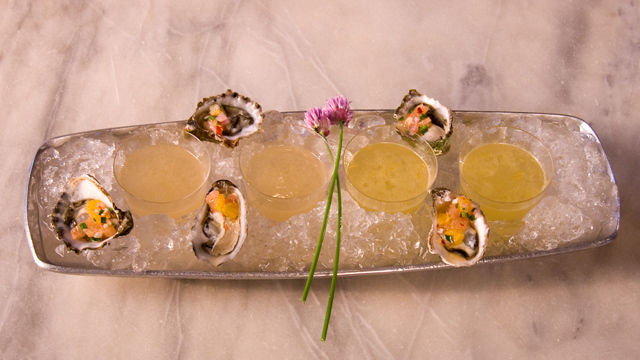 This year, how about treating Mom like the queen she is by making her a specialty bubbly cocktail to toast the day! Mimosas are a spirited way to start the day, made with fresh squeezed orange juice. Get creative and try them with lightly sweetened fresh raspberry or mango puree topped with sparkling wine or prosecco. Guys listen up, you’ll get extra points for this one for sure! For a super, special presentation, freeze edible flowers in ice cubes then place a couple in a large wine glass. 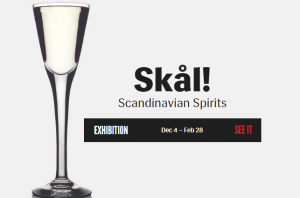 Shake up a jigger of vodka with a splash of Grand Marnier or Chambord, and pour over the ice then top with a big splash of sparkling pink Moscato. Fun and fabulous! My Platinum Sparkle will make Mom smile! And it’s always great to go Northwest. I love Washington’s own Michelle sparkling wine and Argyle, one of my faves from Oregon.